The Super Eagles of Nigeria will later this evening do battle against the Orlovi (the Eagles) of Serbia in an international friendly match slated to take place at The Hive Stadium in London. Sources close to the team’s Crowne Plaza Hotel, Camp situated at the Western Avenue, Hanger in London has revealed to Allnigeriafootball.com that the Super Eagles coach Gernot Rohr may have made up his mind on the eleven players who will be in the starting line-up for today’s international friendly match against Serbia. The Super Eagles of Nigeria had their final training session yesterday (Monday) evening, Leicester City’s Kelechi Iheanacho, Bursaspor defender Shehu Abdullahi and Las Palmas midfielder Oghenekaro Etebo are all reported to be injured and struggling with fitness issues. Although the three players were involved in warm up and light exercise with the rest of the squad, they were however later excused to go and play Tennis as the squad was divided into Team A and Team B for a practice match. The practice match was won by Team A through a goal scored by Alex Iwobi. “He (Iheanacho is out) but that is an opportunity for other players to come in and prove what they can do,” Rohr said during his pre-match conference on Monday ahead of the Serbia game. Gernot Rohr in the press briefing also stated that he is pleased with the two goalkeepers in the team but rued Daniel Akpeyi absence. “One of our goalkeepers (Akpeyi) had a problem with entry visa but so far I’m pleased with the two we have here. Ezenwa and Uzoho,” Rohr said. “At the moment I’m satisfied with the young one (Uzoho). Before he arrived we were a young team and he’s here now and it’s good for the future”. There are strong indications that Deportivo de La Coruña Team B goalkeeper Francis Uzoho will start in goal for the second straight game ahead of Enyimba international of Aba safe hands Ikechukwu Ezenwa. In the defence, it’s almost certain that ADO Den Haag defensive stalwart Tyronne Ebuehi will replace injured Shehu Abdullahi at right-back. While the first choice central defence pairing of William Troost-Ekong and Leon Balogun will keep their place in the starting line up and Brian Idowu will likely also start at left-back ahead of Ederson Ichiejile and Ola Aina for today’s match against Serbia. In the midfield, Vice Captain Eddy Ogenyi Onazi is set to start and will captain the team tonight, while Wilfred Ndidi and Joel Obi are favoured to partner Onazi in a three-man midfield that will battle Manchester United’s Nemanja Matic and Southampton’s Dusan Tadic for control of the midfield in today’s match. In the attack, the coach will certainly stick with the same players that started against Poland except for Odion Ighalo who might be replaced in attack by Ahmed Musa for tactical reasons. Alex Iwobi and Victor Moses will be deployed to play from the flanks, in order to stretch the opponent’s defence and create room for pacy Ahmed Musa to run into space and deliver the goals as the top striker. The Super Eagles coach Gernot Rohr is expected to use a 4-3-3 formation against the Orlovi (the Eagles) of Serbia in an international friendly match taking tonight place at The Hive Stadium in London. Below is how Allnigeriafootball.com thinks the Super Eagles of Nigeria will possibly line up tonight against the Orlovi (the Eagles) of Serbia. 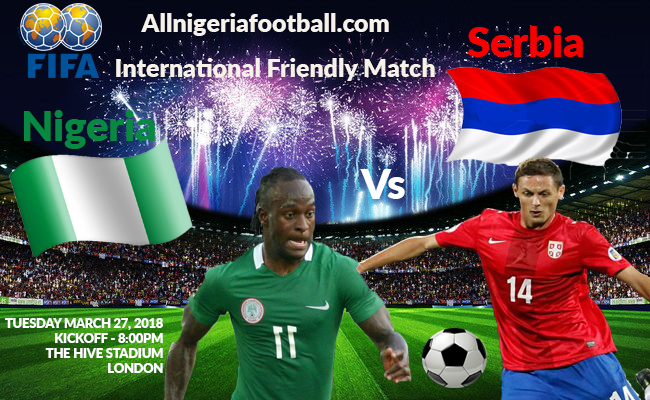 The Super Eagles of Nigeria international friendly match against the Orlovi (the Eagles) of Serbia kicks off at 8.00pm Nigerian time tonight inside the 5,000 capacity The Hive Stadium in Canons Park, London. The Stadium is home to Football League Two club Barnet and London Bees of the FA WSL. Allnigeriafootball.com can authoritatively report that the Nigeria Vs Serbia international friendly match tonight, will be transmitted live by SuperSport 8 on DStv (SS8A) and SuperSport Select on GOtv (SLGO).